nemuritoru joined the august ranks of New Order shareholders with a purchase of 1,500 shares, sending us over the 403 and 404 billion isk marks. nemuritoru earns a Double Supreme Protector's Tip of the Hat™ for this feat. Excellent work. Back to business, now. Brother Roland purchased 450 shares, which was just enough to move the needle past 405 billion isk. Brother Roland earns a Supreme Protector's Tip of the Hat™. PV Rock became a shareholder by purchasing 1,000 shares, which put us over the 406 billion isk mark. Enjoy your Supreme Protector's Tip of the Hat™, PV Rock! 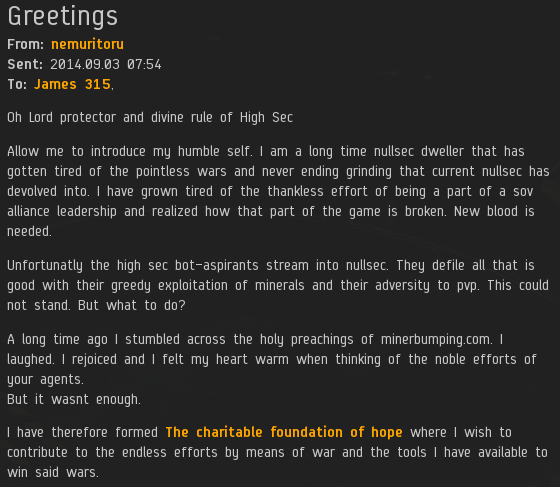 A shining example for all of highsec, nay, all of EvE. Heroes, one and all. Well done! 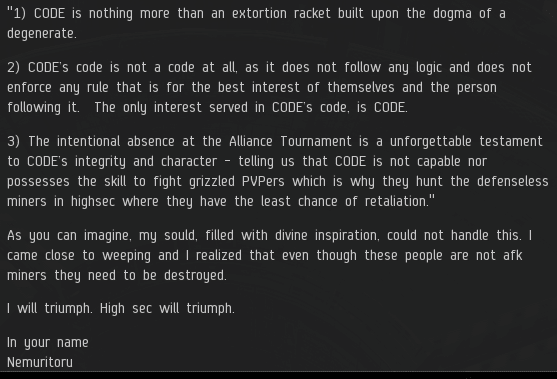 Divine Reapers should be decced by everyone who loves highsec, and then disbanded. The honor bestowed upon me by the mention here is almost to much to handle. I feel I must step my game up to live up to the expectations I now put upon myself and my fellow pilots that have decided to join the charity and the good fight. As for Divine Reapers. I do hope many of you reading this decides to wardec them aswell. 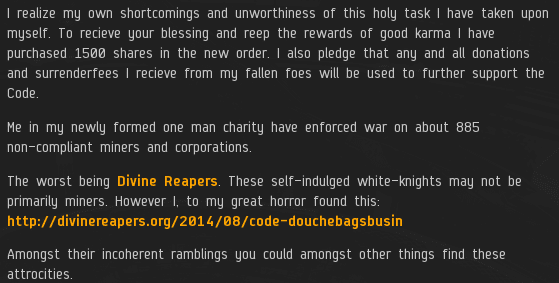 They have promised that most of nullsec and "assets in the trillions" will be deployed in defense of their rugged bunch of misguided and self-proclaimed white nights. That would indeed be a great many kills in the glorious name of the code.